I was very excited when I found this site and couldn't wait to try some of the tips I read here. 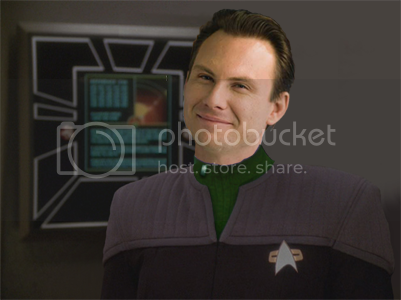 I've done banners and plaques for Star Trek sites and now I've attempted the realm of manips. These are my first attempts. Some of them use images I found on this site for part of the image and I'll give proper credit if need be....and if I can find where they are on here. I'm not afraid of criticism.....that's how we learn. Last edited by Karma Sinclair on Fri Oct 08, 2010 1:25 am, edited 1 time in total. 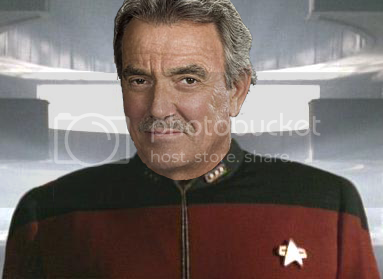 I have no idea who Eric Braeden is but you made him look cool. You might want to try selectively using the blur tool with a few of the others just to help get rid of the rough edges, but considering these are your first attempts I think they’re great. Eric Braeden plays Victor Newman on Young and the Restless (soap opera). The Braeden pics were my very first ones. 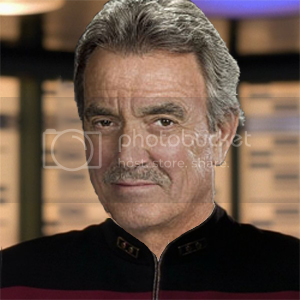 I saw the link to trekcore on here and I've been slowly browsing through the site looking for images I like. Thank you for the input, Spirit. Could you possibly be a little more specific? I'm here to learn so don't be afraid to point out the tiniest detail. 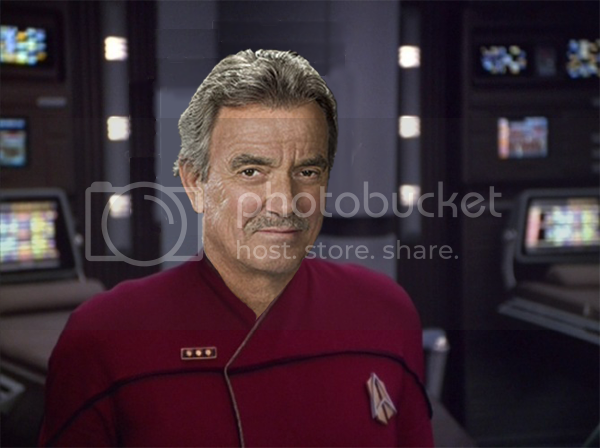 love Eric Braeden as an admiral!! he makes a good one...good choice. You've done very well for your first pictures! As you requested advice, I will say that your edges need some work---and edges can be hard to get smooth! I know it takes a lot of time and patience, believe me, but if you really want a quality manip, you do have to put in the time to make sure your edges are clean and smooth. It's a PITA, but it's worth it in the end. You may also want to pay attention to brightness and contrast, as these are great for helping a face blend with the background. As I've also recently learned myself, don't be afraid to add a little noise/film grain to a picture, because sometimes it improves quality immensely. Again, though, you're doing well for a newb, so keep it up. Our motto here is "Practice, practice, practice." I like the choice of Eric Braeden, and I recognize another Y&R actor, too! Last edited by CamSPD on Fri Oct 08, 2010 6:22 am, edited 1 time in total. For that matter, he was John Jacob Aster in Titanic. Ha! Eric Braeden is the “Of the Boston Dawsons” guy! That’s awesome! Anyhoo I agree with CamSPD. Work on smoothing out your edges (I find blur helps with this), and experiment with brightness and contrast (‘lightning effects’ in GIMP makes this interesting) and keep practising. Your first manips are a far shot better than mine were and I look forward to seeing more of your work. Great pictures for them being your first, they are much better than My first attempts, but then again its been a long time since I first started. Anyway keep it up, practice makes perfect as they say. I just want to add that the colour you used for Triple H is abit purple, but with it being a first image thats fine, I would make it more blue, try using the HTML code of #FF0000 you'll find it in the Font Colour bar when replying to this. Diablos wrote: I just want to add that the colour you used for Triple H is abit purple, but with it being a first image thats fine, I would make it more blue, try using the HTML code of #FF0000 you'll find it in the Font Colour bar when replying to this. 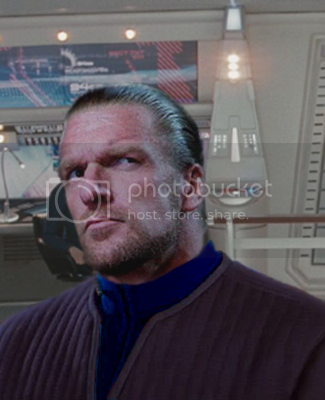 The Triple H pic was an attempt at using Hue/Saturation. I redid that pic and used Color Balance first to remove some of the red. I also used the Blur tool at 50% power to "soften the edges". 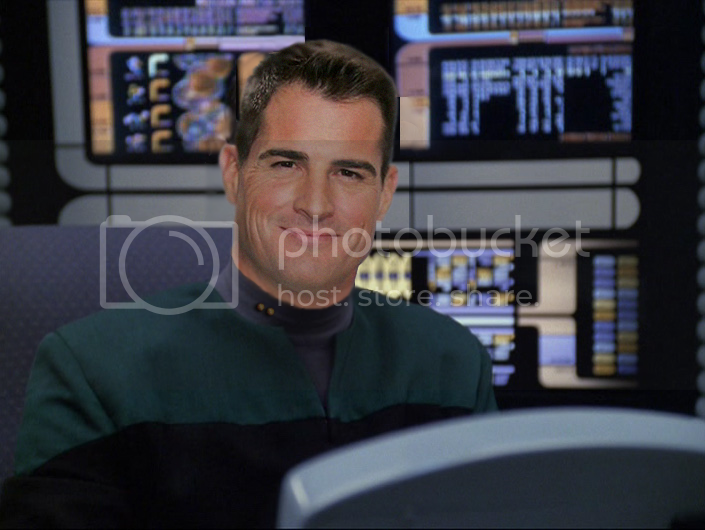 Here's a new one...George Eads as a Medical Lieutenant. 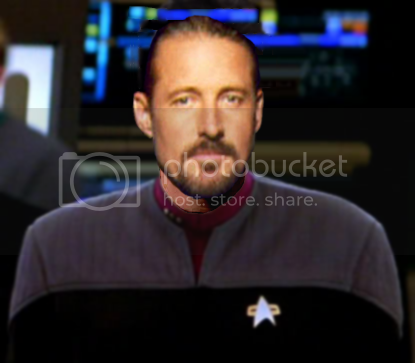 The base image was the Doctor from Voyager sitting at his desk. I had to Copy/Paste parts of the background to cover the top of the Doctor's head and his ears. 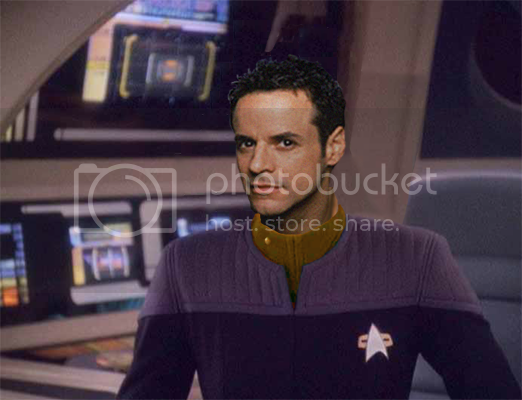 I also had to add the rank insignia to the image since the Doctor doesn't wear insignia. I used Brightness/Contrast, Hue/Saturation, and Noise to try to make the insignia look like it was always there. I also used the Brightness/Contrast and the Noise on the entire head....as well as Blur to soften the edges. As always, pointers and CONSTRUCTIVE criticism are always welcome. That George Eads is not too bad at all. I would not have known you had to paste around the Doc's head had you not said so. Sometimes with a manip you can smudge the background layer around the head, but with that one I think the cut and paste route was better. As for George, you might try reducing the brightness some more on his face so he blends better with the background. 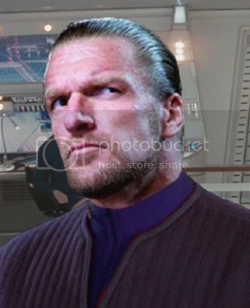 Don't worry about the first collar on Triple H being purple hon--maybe he's in the diplomatic corps! (can you imagine him being a diplomat? ). A good way to recolor, if you're using Photoshop, is to select the area around the collar and put it on a new layer, then got to Images>Adjustmetns>Desaturate. Then select the color you want from the color palette and change your Brush Tool to the Color Replacement tool and paint over the collar. Then go to Images>Adjustments>Hue/Saturation and fiddle 'til satisfied. Oh, and you may also wish to adjust Brightness and contrast, too. Don't be afraid to check out the Resources and Tutorials section for tips on how to do manips. I've found more than one of them really helpful, and I've even posted a few myself (like the one I described above). And if you're using Gimp, don't fret---Mad-Martigan has posted some Gimp tutorials there as well. Keep up the good work and don't be afraid to experiment! Last edited by CamSPD on Sun Mar 27, 2011 8:22 pm, edited 1 time in total. He could have been recruited as a result of the events in "Size Matters". Yeah, but I was going more for the "not what one would expect to be a __________". True, which is why I said "Can you imagine him being a diplomat?"